Trevor Wilson is a Brooklyn-based composer that works chiefly in vocal-centric song cycles. His emerging music career has already seen a variety of explorations, from the popular to the absurd, the melodramatic to mellow. He has developed an idiosyncratic voice that fits in the world of such artists as Bjork, Joanna Newsom, and Devendra Banhart, possesses seasoned piano sensibilities, and has more recently turned his hands to the guitar. While his earlier career tended to emphasize harmonic freedom and density, Wilson's more recent works show him developing a taste for absurdist theatrics, psychedelic verse, and unfiltered emotion. 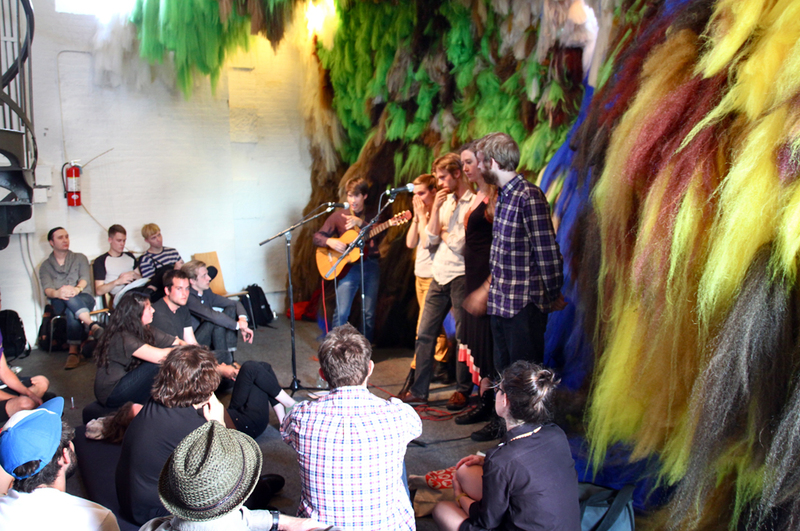 Trevor Wilson and Vocal Ensemble performing in Shoplifter's installation. Photo by Erica Stine. 2012. 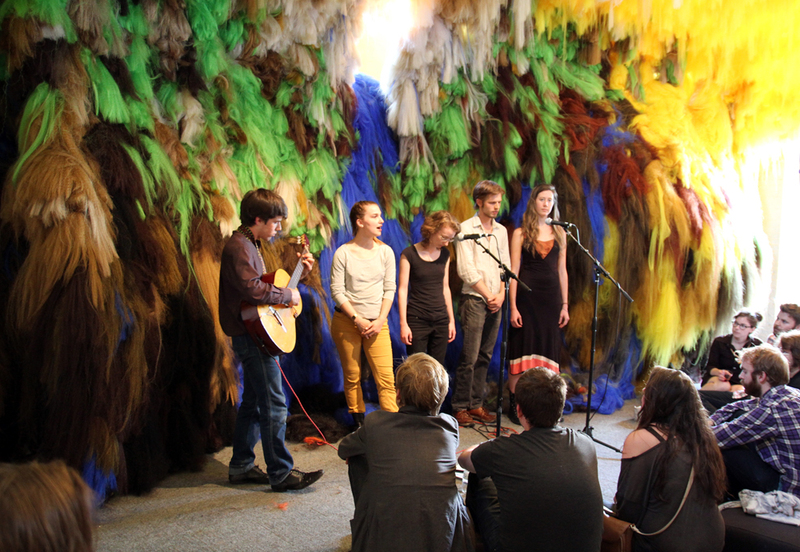 On June 26, 2012, Trevor Wilson and Vocal Ensemble brought their unfiltered emotion to the Clocktower's upper gallery. The ensemble, led by Trevor's idiosyncratic voice, sang songs about sunlight, summertime girls, and aimless adventures from their most recent release Soft Wings. Trevor Wilson is a Brooklyn-based composer that works chiefly in vocal-centric song cycles. His emerging music career has already seen a variety of explorations, from the popular to the absurd, the melodramatic to mellow. While his earlier career tended to emphasize harmonic freedom and density, Wilson's more recent works show him developing a taste for absurdist theatrics and psychedelic verse.